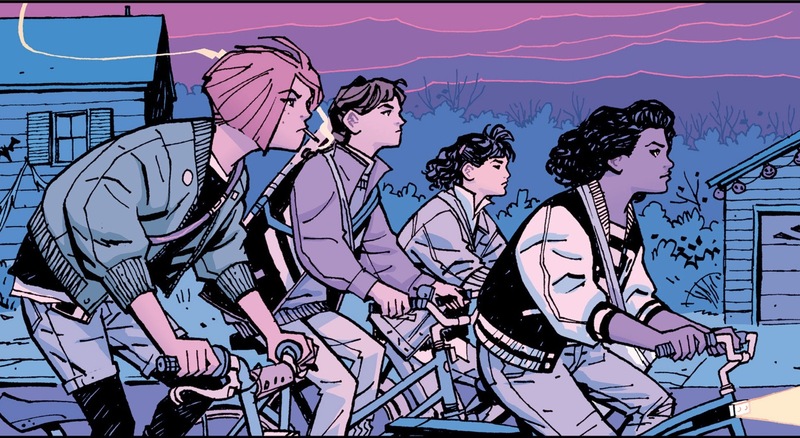 For about two issues, Paper Girls is great. The girls running paper routes are caught up in a strange mystery and they’re just fun to hang out with and watch while things unfold. Cliff Chiang’s art is poppy and fun and everything is going well. And then the Brian K. Vaughan-ness kicks in. Aliens. It had to be aliens. While that isn’t inherently bad, they’re strikingly similar in style to Saga in design and oh boy does Vaughan love to make a bunch of bizarre lingo so he can be hip with the kids. The result is a jumbled mess of words to read that distract from the story and come across as lame. It tries so hard to be cool, but the harder it tries, the more cringe-inducing it becomes. It’s yet another time Vaughan throws away a story with great potential. In the hands of a more restrained storyteller, this book could be great. Instead, it tries so hard to be wacky and zany because this is comics and let’s be ridiculous as possible! It comes off as unnecessarily confusing, trite and childish. At least Cliff Chiang’s art is on point. He has fun with slightly exaggerated proportions and these lovely blues and pinks that create this wonderful twilight feel. And even though the aliens look too much like Saga, they’re drawn with a lot of love. The more I read Brian K. Vaughan, the more I’m convinced he’s not for me. His work always starts out strong, but then becomes worse and worse as it goes along. He needs a good co-writer to restrain his super wackiness and goofy writing. This is yet another Vaughan series that I’ve no interest in continuing.